e is for book: Write in Scrivener, export as an ebook? Write in Scrivener, export as an ebook? Since I’m a picture book author-illustrator, I’m not up to speed on novel and screenwriting software. But I could use a better organizing system for my pb projects, plus have been making notes for a chapter book or two. One of our e is for book members, Christine Taylor-Butler, mentioned Scrivener 2.0 for Mac as a dual solution for both writing and exporting to ebook formats. Special note: images can be included. This video on their site explains the export process into EPUB and Kindle formats; the screenshot below shows the devices the exported file(s) may be read with. The Scrivener program itself looks very useful, with a virtual corkboard to pin up index cards, an outliner, a page view mode, a way to compare revisions, and much more. For novelists, this looks like a great option. Picture book authors using spot art should also check it out (I’m certainly going to!) You can download it for free and try it, so why not? Though it was developed for Macs, there is a public beta of a Windows version. If anyone has used this software to create an ebook, please tell all! I am an unabashed Scrivener fan. Totally great program, especially if you're writing something with a lot of background material. Am looking forward to trying out the export to Kindle option. Just downloaded Scrivener— very impressive! Anyone know if there's a picture book template available for it (or a guide for creating your own)? I can't seem to locate either option anywhere. 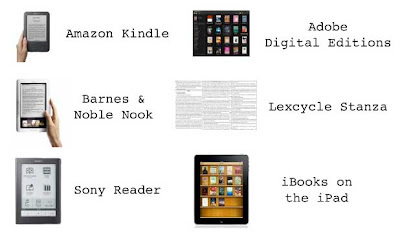 EBOOKS -THE GOOD AND THE BAD- Together? Who decides what an App or eBook should be? Welcome to e is for book!